There is no doubt that Korean cuisine is getting the spotlight in North America. The reason people willing to eat even if they have never experienced any Korean culture; simply, it’s healthy, and as DELICIOUS as healthy. Nevertheless Korean cuisine is getting popular in western; it is still just so hard to find any place to get the quality of food that you can enjoy in Korea. Then, do we really have to wait until the one of your Korean friends invite you for dinner? As a native Korean myself, I finally found THE ONE place to recommend to my Canadian friends who really eager to experience the real Korean food; The restaurant ‘ATTI’ located on University street in downtown. Moreover, the chef of ATTI has been presented an award certificate from Korean Ministry of Culture and Tourism. All the menus ATTI has are totally Korean. No cheating, no fusion. As all Korean dinning does, ATTI serves 4 side dishes (in Korean, Ban-Chan) with your main dish. Ban-Chans are randomly serves depending on the chef’s choice, but if you have any allergies, ask the chef if there are any other choices. Don’t worry. Koreans are always generous enough for food. 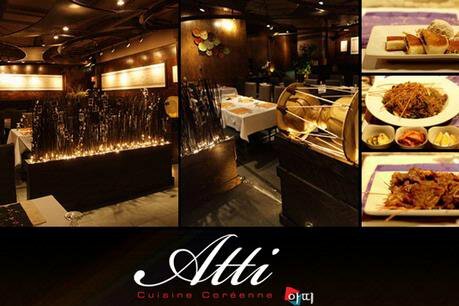 ATTI gives you several choices for main dishes among soup (always coming with rice and ban-chans), grills (Bul-go-gi,gal-bee,etc) and etc. Over all, the foods were just above what I expected from Korean restaurants in Montreal. The appetizer was made of shrimp only, so more I chewed, the more shrimp flavour I got. Shrimps were minced well enough to enjoy the texture and the sweet and hot sauce, which was made of Korean tradition red pepper paste, Go Chu Jang, went really well reducing oily tastes with spicy. My choice of main dish was excellent. Actually, I imagined something similar with Gal Bi which is with bones, but it was not. I would call this as beef ‘dduk gal bi’. Well minced enough and perfectly marinated with the gal bi sauce, based on Korean traditional soya sauce, so you can enjoy the perfect mixture of tastes of sweet and deep salty. It came with a bowl of steamed rice and 3 ban-chans including Kim Chi. For splendid finale, I decided to have Pot bing soo rather than coffee. A spoon of Pot bing soo soothes my mouth with sweet red bean and fruits in it. It’s a cold dessert; therefore, even in Korea, you can only have during summer, but luckily, ATTi still serves it even in winter. Reservation must be needed on Friday and Saturday. Location : 2077 University, Montreal.